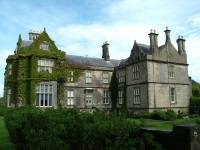 Killarney is located on the edge of the spectacular scenery of Killarney National Park. It is one of the most popular tourist destinations in Ireland, despite its small size. It is a gateway to southwestern Ireland and a great place to discover the countryside, as it is located on the popular Ring of Kerry route, which meanders through the Iveragh Peninsula. Killarney is also a popular base from which to explore the scenic Dingle Peninsula. Killarney itself has many attractions, including Ross Castle, St Mary's Cathedral, and Muckross House, a Victorian mansion near the lake of the same name. Killarney has a small but vibrant nightlife, which buzzes seven nights a week. No visit to Killarney is complete without a ride in a jaunting car, a horse-drawn cart that operates as both taxi and tour guide. Killarney is home to the International Rally of the Lakes, an event which draws thousands of spectators every May and sees the already lively town party even harder. Killarney's most popular attraction, however, is the national park. Deep in the countryside of Kerry, Killarney National Park is a 26,000 acre expanse of rugged mountains, tranquil lakes, peaceful woods and magical waterfalls that entices millions of visitors every year to enjoy the Irish countryside. Attractions in the park include Dinis Cottage, and the Old Weir Bridge. Boat trips around several of the more scenic lakes are available. We are looking for contributors for our Killarney travel guide. If you are a local, a regular traveller to Killarney or a travel professional with time to contribute and answer occasional forum questions, please contact us.